The English East India Company (EIC) was created first in 1600 and its Dutch rival, the Vereenigde Oost-Indische Compagnie or VOC, established two years later in 1602. From the beginning, the companies looked very different. The EIC was formed by private merchants who desired to access trade in Asia, while the VOC was engineered by officials attached to the Dutch state who compelled the merger of a number of smaller trading organizations to form the VOC. The Dutch Company was also equipped with expansive powers which turned it into a hybrid organization, part company and part state. This composite nature can be traced directly back to the company’s foundational document, the 1602 charter, and particularly to a single article. Buried among a sequence of dry clauses stipulating the organization’s complicated business structure can be found article 35, which gave the VOC sovereign rights of the kind more conventionally monopolized by the state. 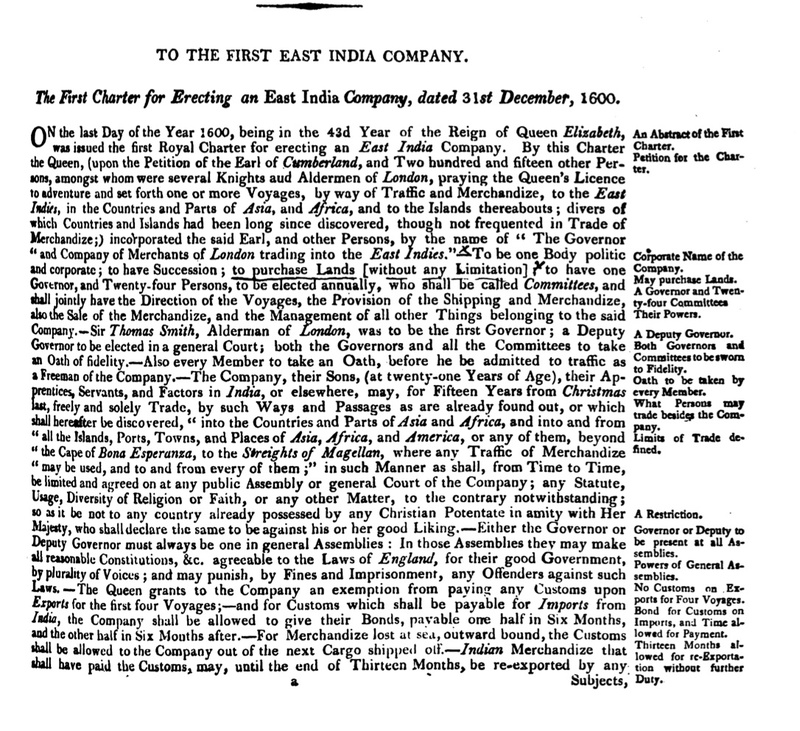 This is the first charter issued to the English East India Company in 1600. It gives the new organization important powers but it also puts it at a clear disadvantage to its Dutch rival, which was given explicit powers to wage war and conduct diplomacy.